Totality — that brief period during a solar eclipse when the Moon is completely centered in front of the Sun’s disk — is a truly amazing sight, so much so that many people who have seen it once (a privileged group that doesn’t include me, sadly!) will travel across the globe in an effort witness it again and again. The video above, taken during the November 14 eclipse from Queensland, shows the moments of totality pretty nicely although the streamer effect can’t really be made out. Still, we get a good idea of how the light changes and we can see another effect called “Baily’s Beads”, where sunlight peeks through some of the relief of the Moon’s terrain along its outer limb. 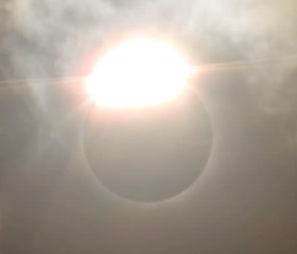 Also the “diamond ring” effect can be seen as the Sun is uncovered. Enjoy, and thanks to YouTube user solareclipse eclipsevidgvale for the upload! Next Post Daphnis Is Back!